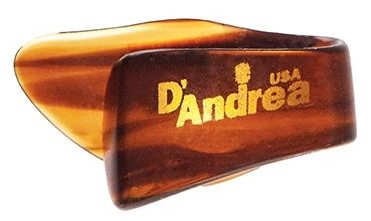 Designed to offer a different form of control provided by flat picks, D'Andrea Plastic Thumbpicks are the solution for fingerstyle players who prefer the tone of plastic striking their strings. D’Andrea Thumbpicks can be used on almost any stringed instrument, giving the player a warm tonal response and increased control. Strings by Mail were great, the order arrived quickly. However, the thumbpicks aren't as described by D'Andrea. I called D'Andrea and explained I use their 1.5mm ProPlec on an acoustic guitar and I'm looking for an equivalent thumb pick in weight and size. Their customer service pointed to this model. It turns out that this thumb pick only resembles the full pick in material (shell), not durability, rigidity, or size. The thumb picks are super flimsy and pointy. I don't know how someone would use these on an acoustic guitar. While I'm not overly concerned with the money loss, it was a huge waste of time purposefully reaching out to D'Andrea. I guess it's on to Dunlop.